Physically the encoders are approx. 4" X 6" -- The ones I have used are the KE24 and LP24. They are both fully programmable in direct mode or matrix, up to a 12X12 matrix giving 144 combinations. 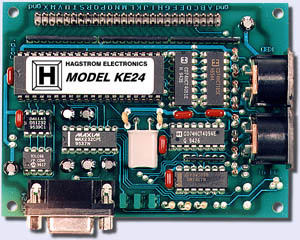 The KE-24 encoder. Keyboard passthrough connectors. 9 pin serial interface for programming. The LP-24 encoder. Keyboard passthrough connectors. Programming through keyboard connectors. 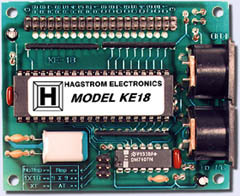 The KE-18 encoder. Keyboard passthrough connectors. Non-programmable. They KE 24 has contacts labled A through X as well as 2 ground contacts. These can be wired direct for a total of 24 controls or in a 12X12 matrix mode for a total of 144 controls. 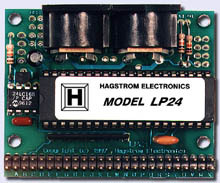 The LP24 has a ground but it is used for troubleshooting. Consequently, you have to use one of the A through X contacts as a ground in direct mode giving you 23 direct controls instead of 24. In matrix mode, you still have a 12X12 matrix, 144 controls. Since the LP24 has only one ground conncetor you can hook up a SCSI 25 pin single row or a 50 pin double row SCSI cable to easily hook up your controls. The KE24 has the extra ground pins so to hook up the SCSI cable you will either bend one set of pins out of the way or cut them off entirely...(only one set of ground pins are necessary. Programming the encoder is also very easy. You boot up in dos mode and load the included program. You will have a menu to select what you want each of the controls to do -- for example in direct mode, connecting (hereafter referred to as shorting) contact A to one of the ground pins will be ESC. Shorting B to ground will be ENTER. Etc. The difference between direct and matrix is that in direct mode each letter (contact point) can be shorted to ground and that is it. In the case of the LP24 direct mode is sort of like matrix but acts like direct. That is, instead of shorting to ground you would say, short contacts A through W to contact X. X in this case is acting like a ground. In matrix mode you assign each letter as a row or column. For example let's say A through L are rows and M through X are columns. Shorting a column to a row gives you a control. So in this example you have 12 rows and 12 colums for a 12X12 matrix or 144 controls. You can short the letter A to any column (M through X) for 12 controls. That is, AM = control 1, AN = control 2, AO = control 3, etc. You can short the letter B to any column for 12 more controls...and so on. When you use matrix mode you still need to be aware of ghosting. This can be solved with the use of diodes. The picture below is an example of using diodes to prevent "ghosting" in a matrix scanning application. Click the picture for a full sized legible view. This method works well, provided the cathodes are connected to the pins that are "sinking" current while scanning. Another method employed in ghost key elimination is arranging the switches within a matrix such that they do not have the electrical possiblity of generating a false keystroke. This requires scanning a matrix larger than the number of keys that you are using, but requires no additional diodes. This technique is used on many computer keyboards.